Another nice new feature that Leganto brings, is the ability to use a Template when creating a new resource list. The Library has set up some pre-prepared templates based on the way course organisers typically structure their resource lists. Templates are a quick and easy way of adding a structure to your list with a single click. 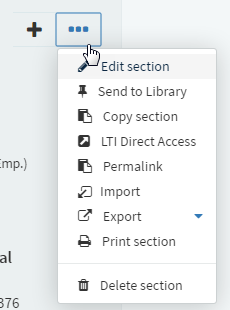 When creating a new list in Leganto, you will automatically have the option to select a template. Combined with the ability to store your favourite resources for re-use in My Collection (as seen in last week’s post), the process of building up a list can become as straightforward as dragging and dropping your resources onto the prepared structure. This is a great way to speed up the list creation process and to ensure consistency across lists. After a template has been applied to a list, it is of course possible to edit/modify the structure by editing any of the individual sections or deleting ones that are not needed. This can be done by opening the options drop-down menu and selecting “Edit” or “Delete” section. You can also add a description to your section (with e.g. specific instructions for students). Course organisers will not be able to set up their own templates, but the Library will have a selection of prepared templates ready for use. 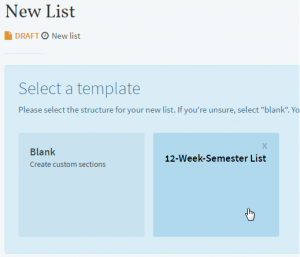 At the initial launch stage there will be three prepared templates available: a “12-Week-semester” template, a “Resource types” template, and a “Reading Priority” template with “Essential”, “Recommended” and “Further Reading” sections. We can add frequently used templates, so if there is a list structure that you use often and find especially useful, please do let us know! This entry was posted in Uncategorized on April 28, 2017 by Iraklis Pantopoulos. The new resource lists system will be launching in June, but our service won’t be changing. Course Organisers will still be able to create their own resource lists or, alternatively, send the details over to the Library and we’ll set up the resource list in Leganto. We’ll announce deadlines in due course – keep an eye on the blog for details. As well as creating and reviewing resource lists, the Library will continue to order new or additional copies of books (or ebooks), process scans and move books to the HUB or Reserve. If you have any questions, please contact us at library.learning@ed.ac.uk. This entry was posted in Uncategorized on April 25, 2017 by Louise Dutnell. 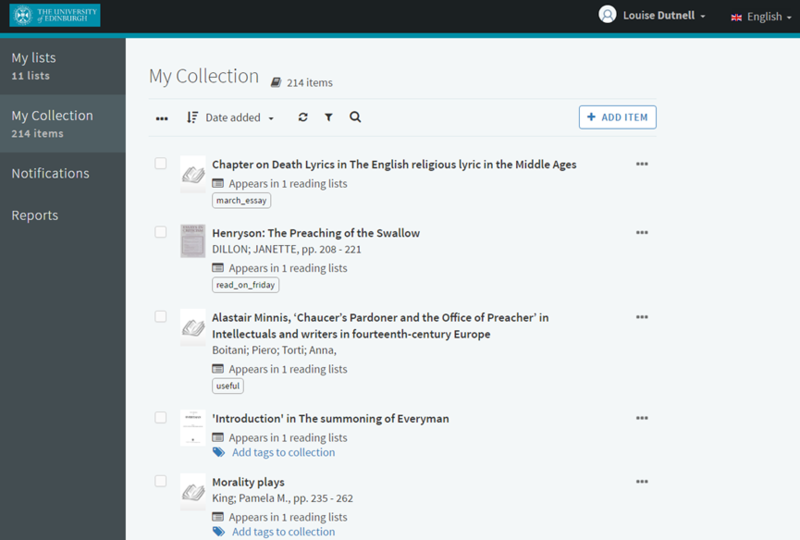 Course Organisers and students will have a My Collection area in the new resource list system, Leganto. My Collection lets you collect and store relevant items; these can be any type of resource, physical or digital. My Collection items can be annotated, sorted and filtered, and exported to create a bibliography (you can select your preferred citation style too). 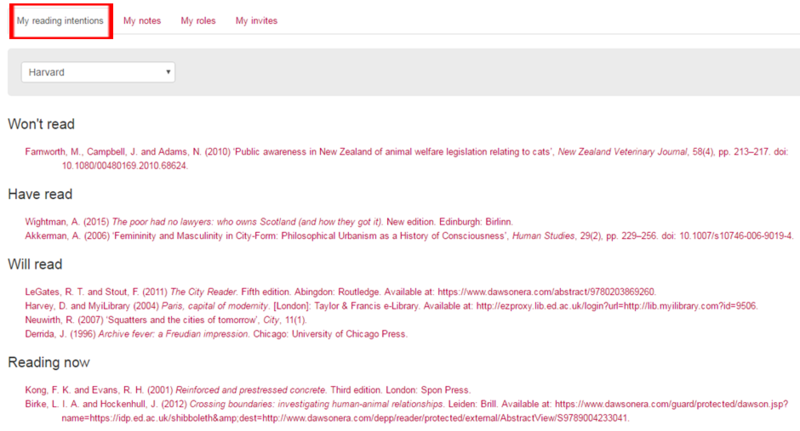 Course Organisers can also use My Collection to gather together resources ready to drag and drop into resource lists. Over the next few months we’ll be putting together guidance on how to use all the features in Leganto. In the meantime, here’s a quick look at some of the things you can do with My Collection. You can also import items from a .ris file; Course organiser, if you’ve saved your bookmarks from Talis Aspire, you can import these directly into My Collection in Leganto. Last week’s blog post explains exactly how to do this. If you want to group together a number items that you need for a specific project, or perhaps remind yourself about something you’ve read, notes and tags are a great way to manage your items. nobody else will be able to see these, even if the item appears on a resource list. Using the icons at the top of the screen, you can manage your collection of items, either by sorting, filtering by tag, or searching for a specific resource. This is a useful way to view the resources for different courses and assignments or to pick a selection of items to export for a bibliography. Found something that could be added to a particular resource list? If you come across a useful item, you can choose the option to ‘Suggest this item’ and a notification is sent to the Course Organiser. After collecting your resources, you can use the items in My Collection to begin building a bibliography. 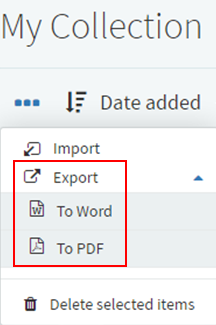 Just select the relevant items (this is even easier if you’ve used tags to identify which items are useful for each of your projects) and export the resources to Word or as a PDF document. If you export to Word, you can also specify which citation style you’d like to use. Remember, your current bookmarks in Talis Aspire will not be copied automatically to Leganto. If you’ve got bookmarks that you’d like to move over to Leganto, have a look at the guidance in last week’s blog post and take a copy of your bookmarks before Monday 10th July. Please contact Library.Learning@ed.ac.uk if you have any questions. This entry was posted in Uncategorized on April 20, 2017 by Louise Dutnell. Leganto – What’s in a Name? As we prepare to officially launch Leganto – our new Resource Lists system – in the next few weeks, we thought we would let you know a bit about the meaning of the term Legan to itself. comes from the verb legi (meaning to read), in the constructed language of Esperanto. Esperanto dates all the way back to 1887 and was first promoted by L. L. Zamenhof. It is nowadays spoken by up to two million people (source: esperanto.net), with roughly 2,000 native speakers, making it the most widely spoken constructed language (or conlang) in the world. Other famous conlangs in popular culture include Klingon and J.R.R. Tolkien’s elvish languages of Quenya and Sindarin. Zamenhof published the first book in his constructed language under the pseudonym Doktoro Esperanto (which translates as “one who hopes”). So, exactly along the same lines, the meaning of Leganto is “one who reads”, a Reader. Now that you know the origin of its name, over the next few weeks there will be a chance to read all about Leganto and its range of features in our regular blog posts. In the meantime, if you would like to find out more about invented languages there is a variety of sources on DiscoverEd. This entry was posted in Uncategorized on April 18, 2017 by Iraklis Pantopoulos. As part of the move from Talis Aspire, the Library will copy all published resource lists from 2016/17 to the new reading list system, Leganto. We’ll also copy archived lists, lists with no time period (Vet school) and any lists you’ve let us know you’d like transferred. 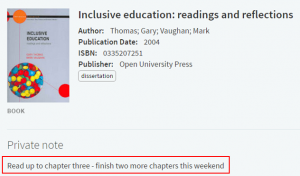 The complete published resource lists WILL be copied, but the individual bookmarks that course organisers have saved will NOT be copied automatically to the new system. Bookmarks are the resources you save to add to a list. You see these on the right of the screen when you’re creating a list. Most of your bookmarks will already be in use on a resource list. You only have to follow the guidance below IF you have bookmarks that you have kept to add to a resource list at a later date and want to copy these to the new reading list system. If you have bookmarks that you would like to move to Leganto, please follow the guidance below to take a copy of the bookmarks before Monday 10th July. There will be no access to Talis Aspire after this date. 1. Log in to your existing the Resource Lists @ Edinburgh account at: http://resourcelists.ed.ac.uk/ using your EASE login. 3. Tick the top checkbox on the left-hand side to select all your bookmarks. Alternatively you might want to only export selected bookmarks by clicking only the checkboxes of those items you want to export. 4 A) Click on the Action blue button on the top right. 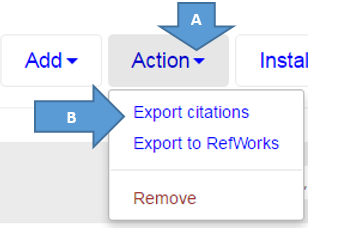 4 B) From the drop-down menu that appears select Export Citations. You now have a .ris file containing all your selected bookmarks. Keep this file. Once you have access to your reading lists in Leganto, you can use the .ris file to import your current bookmarks into ‘My Collection’ in Leganto. 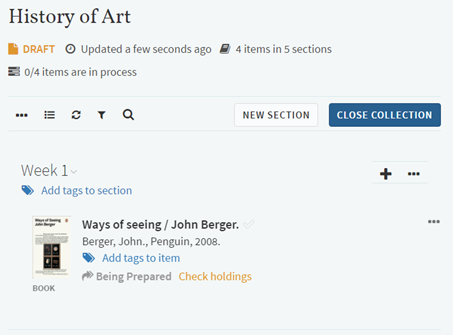 Using Leganto, Course organisers and students have the option to add resources (citations) to ‘My Collection’ where they can add tags and make notes. This entry was posted in Uncategorized on April 13, 2017 by Iraklis Pantopoulos. Over the last few months, Library & University Collections, with support from IS Applications, has been carrying out a procurement project to select a reading list system. This was necessary as the contract with our existing supplier, Talis, is coming to an end in July and, in order to comply with procurement regulations, we were obliged to look at all viable systems on the market. Following a thorough and rigorous evaluation process which involved representatives from all key stakeholder groups, including academic staff and students and colleagues from across ISG, the contract was awarded to the highest scored supplier; Ex Libris with their reading list system, Leganto. Leganto offers an intuitive interface for both Course Organisers and students, providing more opportunities for students to engage with their resource lists and for Course Organisers to liaise more easily with the Library in the provision of course materials. Leganto will also allow the Library to be more efficient in its support of a growing resource list service. The project team is working on implementing Leganto and will migrate existing resource lists to the new system, so that when Leganto is launched in June, resource lists will be ready for review and for students to use well in advance of the start of Semester 1 2017/18. The Leganto reading list system is supplied by Ex Libris who also provide DiscoverEd and the backend Library management system we use, Alma. Leganto is a new system, but there is a growing list of UK libraries using it including, Imperial College, Kingston University and Abertay University. We’re looking forward to working with Ex Libris to deliver a reading list solution that best meets the needs of staff and students at the University of Edinburgh. This entry was posted in Uncategorized on April 4, 2017 by alaurins.